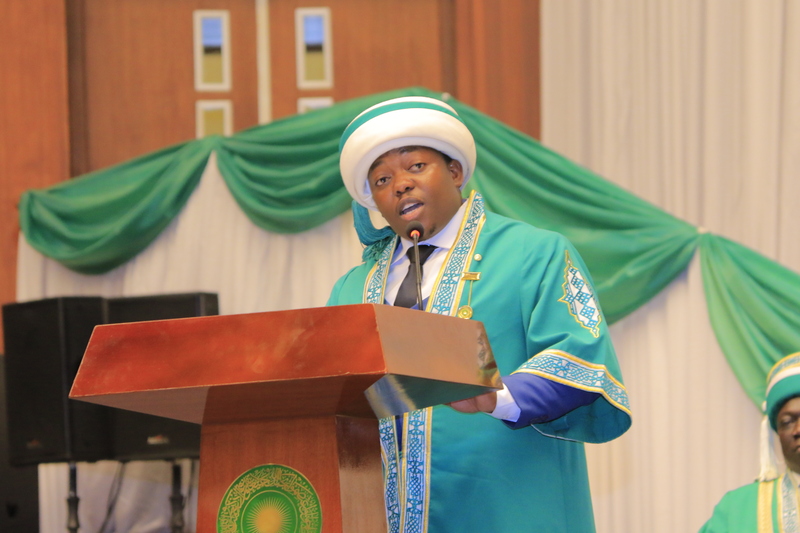 Simon Batte, BSc Nursing, speaking at Aga Khan University convocation ceremony in Kampala, Uganda. I am honoured to address you on this special day, together as we share the emotions filling this auditorium as we graduates close this chapter of the beginning of our life story. Today, here we are after a challenging academic journey, which we have been able to complete successfully through hard work, diligence and determination. However, wading through the mighty waters of Aga Khan University until we have reached the dock has not been entirely easy. I, therefore, take this opportunity to first thank the almighty God for having seen us through. Our beloved parents, husbands, wives, our beautiful family members and friends, we are very grateful for the endless support you have given us even when seemed like we were detached from you and we were on a different planet, you’ve always been there! Our employer, we are very grateful even when we have had excuses, you’ve always borne with us because you knew that we chose the right path. Pure gold is refined with fire, our faculties and the entire staff of Aga Khan University you have always been there through thick and thin what more can we say? “We have balanced the boat.” Even when you became a little tough and tight, it was for this noble cause. All we can do is to pray to God to give more years and more wisdom like King Solomon. Faculty Grace Nakate you are the best mum we have met, not forget the beautiful story of the man who wanted to bury his horse but it kept shaking off the dust. Dr. Ekaete when you came in, you made us get the deeper insight of our profession. If it was music, then that was the voice missing to make the song sweeter. And I am sure my colleagues from the MEd programme by similar great faculty at IED, Dar-es-Salaam. You have reminded us that we often forget, or take for granted the most obvious things around us. Yet they matter so much and always create a difference and if we are to be nurses and midwives of difference, we have to take into account what is obvious. You have encouraged us to be prepared to leverage and maximise the advantages of whatever forms of diversity we find in our professional environments. To my fellow graduates, we have all come from different programmes, masters of Education, Bachelors of Science in Midwifery and Nursing and Diploma in general nursing. The Aga Khan University joined us together as a mighty team, we have learnt a lot from each other and we are very grateful to God that we met. Challenges have been there but together as a team, we had to learn the group dynamics and it is what has made us reach this day as one. The professions of nursing and education in Uganda are still at their infancy and we as a team, are being sent out to ensure we make this “child” grow through the knowledge we have acquired and not to be selfish but to address the ever increasing needs of our mothers, fathers, brothers, sisters and our children in the community today. When we are out there, the community expects a lot from us and we pledge here today to give them our very best. This is a kind request to president Rasul to convey our heartfelt message to the chancellor his Highness the Aga Khan for the special financial support to some of the less privileged students from Moroto and Ntungamo districts of Uganda, through the First Lady Janet Kataha Museveni. We are very grateful. Johnson and Johnson Foundation; we do not even know how express our sincere gratitude. You have made us see this bright and wonderful day without fail and we have been able to reach out to the noble calling. There is a time when some of us felt giving up because everything had become too much, but it is the time you came in and you changed the game. You were heavenly sent. We are grateful. Finally, today were are coming out as leaders because we are now professionals. We can only be the best care providers, best advocates and educators if we also see ourselves as leaders and we have to strive and demonstrate the required qualities of leadership at our places of work. We promise not to just be leaders but rather transformational leaders; applying evidence-based practice, embracing the increasing impact of technology, take on leadership positions at higher level and improve the quality of care provided to our clients in Uganda and beyond! I salute you the class of 2018.